In recognition of Child Month, the Heal With Hope Foundation (HWHF), a non-profit organisation dedicated to the prevention of child sexual abuse, is continuing its public sensitisation drive about this silent epidemic that is plaguing Grenada. Starting with the parish of St Patrick, the foundation will host the 1st panel discussion in the village of Mt Rich, at the Mt Rich Community Centre on Sunday, 8 October from 5–7 pm. Prior to the commencement of the discussion at Mt Rich, patrons will be treated to a friendly football match between Mt Rich SC and Hard Rock FC, beginning promptly at 2 pm. The 2nd parish the HWHF will visit is St John. That panel discussion will be hosted at the Gouyave Open Bible Church on Wednesday, 11 October, also from 5–7 pm. The general public and, in particular, residents of Mt Rich and Gouyave and the respective neighbouring communities are invited to attend and be part of this necessary conversation. 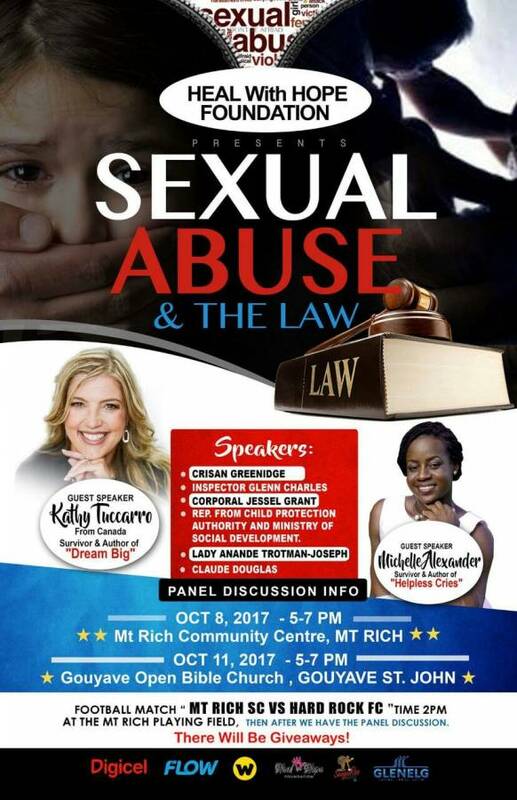 The panel will consist of experts within their respective fields to discuss matters such as the laws and penalties associated sexual offences; the challenges law-enforcement officers face in the investigating of cases; current practices and strategies utilised regionally and internationally in combatting sexual abuse; and the roles of various organisations in the reporting and investigating of sexual offences. Guest speaker Kathy Tuccaro of Canada, a survivor of sexual violence and advocate of the book ‘Dream Big’ has returned to Grenada to share her story of abuse, betrayal and redemption, in the hope that it can be an inspiration to victims toward overcoming the abuse encountered. Sexual abuse thrives in an environment of secrecy and shame and has become a public health problem that affects both genders and society, in general. With a surge in the number of reported cases it is of utmost importance that the general public is provided with critical information that will assist in reducing their risk of becoming victims to this social ill; the processes as it relates to reporting and handling such cases; and the roles that individuals can play in helping protect their communities and provide support to victims. The panel discussions are sponsored in part by Waggy T Rentals & Sound Company, Glenelg Natural Spring Water, Digicel, Flow, SengaRee Accents and the Heal With Hope Foundation. More recently, the organisation has been encouraging performing artistes to support the fight against Child Sexual Abuse; and many, including Blaka Dan, Little Natty, Mush Man, Valene and Runi-J have partnered with the HWHF in denouncing these heinous acts against children.